I've sussed it out now how I can make a link work. Just had to manipulate that html code a bit more. What a load of jibberish 'tis all to me. All those symbols you never ever seem to use when just writing plain text. I cannot recall the last time I had to use a "/" or a ">". What is the world coming to? Fascinating how by just punching a few strange random symbols I can just point you to an article on tinterweb. I feel like a granny discovering a gramophone for the first time. Give me templates and fast link buttons any time. Work for me you damn computers! Luckily I have a copy of Daniel H. Wilson's book How To Survive A Robot Uprising I would advise anyone reading this blog to go out and buy it. Don't order it on the internet or THEY'll know you've got one! Phil praises Vari*Lites at Dusseldorf in the LTU Arena! 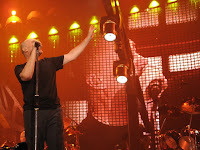 Kind of ironic to see Phil Collins in this stance, trying to reach the V*L's. Stuck in traffic this morning and this is just one of four trucks remodelled on site. Not only Wei Wei is having some trouble. Apparantly Sakare Krue-On wanted to cultivate some rice on 7000 square metres,but is experiencing some irrigation problems. And Sanjo Ivecovic's poppyfields do not want to grow. before you reach the second http. I'm trying to get it to work, so please bare with me. Read about Wei Wei's Demise first. Now how about that. Isn't that ironic. "It was intended as an elegy to China's rapidly vanishing past." I stumbled accross -and over- there on the Reuters feed. How can any prosecutor state they will start a criminal investigation? It can hardly be on the basis of article 528 of the Italian penal code. Ever seen 'Le Bambole' starring the ever lovely and talented photographer Gina Lollobrigida? Let's take a giant seven league boot strut into time back to 1965. Well, it got political, some people polished up on their grovelling and tried their hand at censorship. For the full story read the Time article of those days. A reviewer summed it up neatly: "If the shock's gone much of the interest's gone. What remains is an interesting document of morals in the mid 1960s." A few decades later some tried it from a different angle. Corrupting those young Italian adolescents using those lewd dens of depravity mascarading as libraries eh? You foul depraved libertine librarians! So how far can this be streched? How can an act from 1948 be enforced today in the sense it was 20 or even 40 years ago? I can hardly fathom Italian society has not evolved? Proof? Ilona Staller (a.k.a. La Cicciolina) got elected to parlement in 1987. In the UN paper 91(a) can only be reinforced if it could cause potential harm to the sense or moral values. Or intice people to become involved in corruption (We are talking the land of Mr Berlusconi here!) or commit crimes or suicide (well, it did have some pretty bad acting in it at times but it wasn't THAT bad...). Based on this I would suggest the plaintiffs would only go for the angle of it being 'religious corruptive'. The other traits are hardly tangible and would be thrown out by any judge with a bit of sense betwixt their ears or even a sultana for a brain (unless they've seen the movie as in the plaintiffs claim, implicating the judge is already corrupt thus proving their own point and probably finding the outruling biassed or influenced and screaming blue murder they will never get a fair judge to hear the case). So some prosecutor in Italy is dancing to the ancient tune of religious groups with censoring causes groaping for a number 528. Against common indecent exposal? (no) sexual morality? (no). "A complaint against the film was filed by a group of clergy near the Italian village of Civitavecchia"
Hmm. Civitavecchia clergy. It must be the Franciscans in the monastery then. It can harly be the Buddhist monks there? Luckely I was wearing my corset or I believe my sides would have split. Read on. "Asked why the case was being opened now, some 13 months after the film debuted at last year's Cannes Film Festival, an official at the Civitavecchia state prosecutor's office said he wasn't sure. "I don't know," the official told Reuters. "Maybe they [the clergy who brought the complaint] have just seen the film." Tee hee. Maybe they have been saving for the 2 Disk Special Edition DVD Box. And it has only arrived earlier this year. You know how Amazon can be such a drag if you don't tick the Express box to complete your order. So they must have missed out on the whole ruse earlier. The book appearing in 2003 and that cardinal Bertone telling people "to shun it like rotten food" two years later in 2005. On any accounts don't buy this book or give it as a gift to anyone! You will certainly not climb the ladder of the recipients' esteem in any case. It is not even remotely funny. Or witty. Or priceless. Some stuff found in the Private Eye Diary section is far far more enjoyable. The only 2 pages containing the Kafka pastiche spoof with the man's hand turning into a mouse made me contemplate a faint smile. I wonder what would happen if I walked passed Phil Collins and I was wearing a T-shirt with text on the back reading "Final Farewell Tour" and a picture of a Mr A. Blair on the front? By the by: If you want to book Willy's quartet, they trouser about 1860€ a go (ex tax and tuned piano). Where did that number come from? Would that fee approximate the original fine (60000Bfr) Mr. Claes had been ruled to pay after he was sentenced at the Agusta and Dassault sleeze scandal trial way back in 1998? Or may be he has forgotten all about being at the opera on Sunday. Never heard an opera audience gasp with anticipation at what was going to happen next. Just minutes into the first scene a little girl loses her prop -a heavy looking leather trimmed ball- and it starts to roll at an excruciatingly slow pace toward the orchestra pit. She is reluctant to recover the object. Eagerly the audience await the fall of the object unto a member of the symphonic clique residing below. And just as the leather orb decides to jield to the forces of gravity a communial breath is drawn -hardly inaudible- and then ... exhaled as a black cargo net prohibits the malicious pleasure object from fulfilling it's anticipatory flash of excitement. Even ex NATO secretary general Willy Claes, who attended the matinee, probably heard the ball roll because he wasn't wearing glasses.